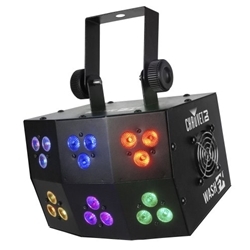 The Wash FX is a rugged, punchy wash light with 6 zones of control for pixel-mapping effects. Its unique shape casts punchy colorful light everywhere, and it is tough enough for any mobile entertainer's lifestyle. The Wash FX can be controlled manually with the control panel or with a DMX controller, and the built-in, eye-catching effects make any kind of control a breeze. For advanced pixel-mapping use ShowXpress Pixels from CHAUVET DJ.